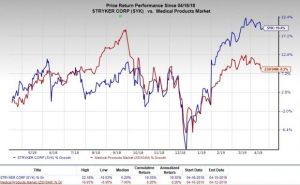 Stryker Corporation’s SYK first-quarter 2019 results are scheduled for release on Apr 23 after market close. Results are likely to be driven by a strong show of the core MedSurg segment. A bullish 2019 view also buoys optimism on the stock. The Zacks Consensus Estimate for first-quarter earnings per share is pegged at $1.84, reflecting a year-over-year improvement of 9.5%. The same for revenues stands at $3.52 billion, mirroring 8.5% growth over the prior-year quarter. Let’s see how things are shaping up before the earnings release. This segment consists of surgical instruments plus endoscopic and emergency medical equipment. Significantly, it has been consistently driving Stryker’s top line. It is encouraging to note that for the quarter to be reported, the Zacks Consensus Estimate for the segment’s revenues stands at $1.52 billion, up 6.7% year over year. MedSurg has three subsegments, namely Endoscopy, Instruments and Medical. MedSurg is likely to deliver a solid performance in the to-be-reported quarter, primarily driven by anticipated growth across its aforementioned three subsegments. A sturdy commercial excellence, capability to indulge in the consistent launch of new products and the ability to successfully integrate buyouts are expected to contribute to this upside. In the first quarter, the company is likely to have displayed broad-based strength across its divisions and regions. This is supported by the first-quarter earnings projection wherein the adjusted EPS is estimated between $1.80 and $1.85 per share. In fact, for 2019, Stryker anticipates earnings in the range of $8-$8.20, representing a year-over-year increase of 10-12%. The Zacks Consensus Estimate for earnings is pegged at $8.13, lying within the guided range. Further, the company’s Orthopaedics segment is expected to have witnessed strong organic growth, attributable to Trauma and Extremities along with envisioned robust growth for Mako. For the quarter to be reported, the Zacks Consensus Estimate for this segment’s sales is pegged at $1.27 billion, indicating a year-over-year rise of 4.1%. With respect to Neurotechnology & Spine segment, a bankable performance within the NeuroTech product lines and the K2M buyout are expected to drive its results. Moreover, sustained demand in Europe, China and Japan is likely to lead to segmental growth, internationally. For the upcoming quarterly announcement, the Zacks Consensus Estimate for the segment’s sales stands at $725 million, depicting year-over-year growth of 21.2%. Given Stryker’s acquisition-driven strategy, which boosts revenue opportunities, the company might incur integration expenses on this front. The gross and the operating margins are weighed on and the company expects acquisition integration activities to leave a bigger impact on the operating margin during the first half of 2019. Additionally, on its last earnings call, the company noted that foreign exchange rates are expected to affect sales by around 0.5% in 2019 and the EPS is forecast in the range of flat to 10 cents for the full year. In the first quarter, the EPS might be adversely impacted within the 2-4 cents band. Our proven Zacks model clearly shows that a company with a solid Zacks Rank #1 (Strong Buy), 2 (Buy) or 3 (Hold) has good chances of beating estimates if it also has a positive Earnings ESP. You can uncover the best stocks to buy or sell before they’re reported with our Earnings ESP Filter. Stryker has a Zacks Rank #3, which increases the predictive power of ESP. It also has an Earnings ESP of +0.35%, together which a likely positive surprise is indicated for the stock this reporting cycle. Conversely, stocks with a Zacks Rank #4 (Sell) or 5 (Strong Sell) should never be considered going into the earnings announcement, especially when the company is seeing negative estimate revisions. Here are a few other stocks worth considering from the same space as these too have the right combination of elements to beat on earnings this time around. NanoString Technologies, Inc. NSTG has an Earnings ESP of +3.08% and a Zacks Rank of 3. GW Pharmaceuticals plc GWPH has an Earnings ESP of +8.33% and a Zacks Rank #2. 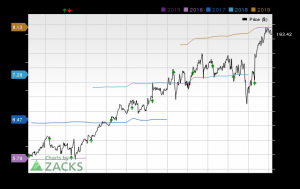 TG Therapeutics, Inc. TGTX has an Earnings ESP of +1.08% and is a Zacks #3 Ranked player. You can see the complete list of today’s Zacks #1 Rank stocks here.